Enjoy ideal viewing conditions along the Path of Totality at one of the FLATTEST & WIDE OPEN viewing locations in Christian County! 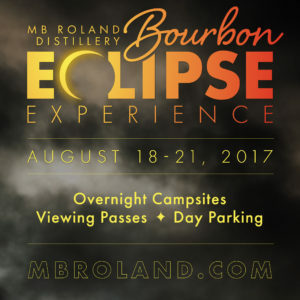 Just bring your car/tent or camper/RV and park onsite to enjoy totality of the 2017 Total Solar Eclipse, along with the beauty of Western Kentucky, the Kentucky Bourbon Mashoree event, live music, food trucks and more! Throughout the weekend & day of the Great American Eclipse, we’ll have food trucks, adult beverages, live music and a wide open space for viewing this wonderful event! No refunds of single day passes after AUG 7TH. No outside alcohol allowed on the property, only commercially sealed non-alcoholic containers are allowed. Outside coolers/food are allowed, but will be searched prior to being allowed entry. No grills/fires. In order to best enjoy the Eclipse, we will not allow fixed canopies/shade items. Hand-held umbrellas will be allowed, plus we will have our Dairy Barn and a shade tent open throughout the day. Well behaved dogs on leashes are welcome. This is unique, once-in-a-lifetime event that you don’t want to miss! *Please contact MB Roland Distillery for any questions regarding buses, RV’s, travel trailers, etc. You are allowed to bring as many people that can reasonably fit in your space. For additional event tickets and/or merchandise packs, please contact us. *Note: No electrical/water hookups available, please contact us about the usage of generators. Add optional Friday or Monday night for only $100! **For those interested in a day pass on Eclipse Day (Aug 21st), we will have more info to come or contact us. Eclipse Day Passes are sold out!